Keeping with the guilds theme I’ve had going for a while now, I decided that this time I would brew up a deck around the Azorius guild. However, I didn’t really want to build a deck around their new leader from Ravnica: Allegiance, so instead I picked another Azorius commander that I’ve had in my collection for quite some time and always wanted to build around. 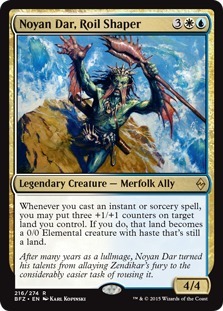 That commander is, Noyan Dar, Roil Shaper. Land Tax and Weathered Wayfarer are arguably the best ramp available in white. Both will get you extra lands every turn. Knight of the White Orchid and Gift of Estates are a little more restrictive, but if played at the right time they’ll get you more lands, but only plains. Solemn Simulacrum gives us some ramp and card draw for a fair price. Now that we know we’ll have plenty of ways to ramp and benefit from casting spells, let’s look at our spells themselves. Blue is great at card draw and card selection. These cards will allow us to look at chunks of our library and get to what we need faster. There are some that also allow us to shuffle if we really need to shake things up a bit. Any good control deck should have various forms of removal, and I’ve tried to cover the gamut. In some cases we’re using staples like Path to Exile and Swords to Plowshares. In other cases we’re using some different cards that I wouldn’t normally play, but they work in this deck. Destroying non-land permanents (board wipes) are great for this deck as you’ll be able to destroy all the creatures on the board that your opponents control, but you’ll still have your lands. Of course you’ll need to have some counterspells handy so that you can avoid other player’s board wipes or pesky cards like Jokulhaups or Armageddon which will absolutely do you in. I’ve included a small counterspell package, along with some cards that will proliferate or support for more counter shenanigans, along with ways to take extra turns. A couple of decent tutors for enchantments/spells, and a couple of other tricks like To Arms! and Unity of Purpose which will effectively untap all of our lands if timed properly. Mirrorweave is one I look forward to playing in particular, especially when someone drops a nice Dragon/Angel/Demon that isn’t legendary and I can then make all of my lands into big beaters for a turn. One thing we’ll want to avoid is our lands being destroyed while in creature form (or in general). Sacred Ground and Terra Eternal help with this immensely. The former will bounce any land that hits the graveyard back to play, and the latter makes our lands indestructible. Diplomatic Immunity is extra protection for Noyan, giving him Hexproof. This last category are actual man-lands. These are cards that can be turned into creatures for a cost. I’ve included these because not only will they tap for mana, but they can also turn into chump blockers in a pinch, and it’s more desirable to lose these than our 3/3 elementals for the most part. They can also be beefed up with Noyan if we want to go that route. I’m not thinking this is the strongest strategy for competitive playgroups, but I think it could be a fun to play build that can get out of hand if not put in check. The thought of having either a ton of tokens to swing for tons of damage or alternatively being able to make a bunch of lands pretty big to kill someone with sounds like a blast.